In our range of products, we offer Vacuum Tank for PVC Pipe Processing that are used for removal of dust from the PVC pipes. These tanks make use of pneumatic system for vacuum creation of 8 to 14 Kg. This helps in proper functioning of the vacuum and maintains its performance. 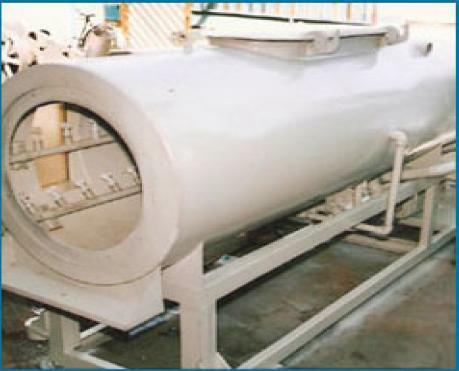 These tanks are accessible in diverse capacities and technical specifications as per the need and requirements of the clients. Mary Engineering Works was incepted in the year 1992, in Nasik (Maharashtra), with the prime motive to provide excellent machines to esteemed customers. Started as a small maintenance enterprise, we have gradually mastered in the manufacturing of material equipments as well as ball mill. We have successfully attained an insurmountable position in the market, under the strict vigilance of Mr. Proshanto Kumar Mondal, the CEO of the company.